From your mother? “Take at least 30 minutes of uninterrupted “you time” daily. Whether reading, exercising, or simply taking a hot bath—it does wonders for my psyche. Moreover, it leaves me feeling invigorated—ready to tackle the day’s challenges with patience and poise. Doing yoga. It hones my mental focus and rids my system of toxins! Life is an adventure! Travel, take lots of photos (you will never look this good in a bikini AGAIN! )—and buy stock in Apple! The traffic in DC is abominable. If I had a driver, I could accomplish a gargantuan amount of work merely on my commute! I honestly love what I do—as cliché as that may sound! Knowing that my work has genuine purpose—that in some small way I may have shaped the life of another human being. It’s awe-inspiring and humbling. Activity? Watching reality television and buying expensive shoes. I check email first, then make my way to the Washington Post. I think I: enjoy life more with each passing year. I wish I: didn’t opt for a ballerina bun this morning. In addition to fostering a love of literacy within her unprivileged high school students, Jennifer has many noteworthy philanthropic accolades. During her husband’s plight with cancer, she single-handedly raised over 3,000 books for the Johns Hopkins Hospital Oncology Patient Library. 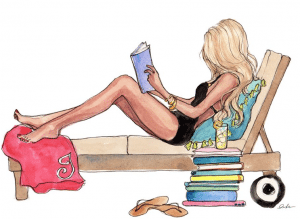 Jennifer is now sharing her unbridled passion for reading via Confessions of a Bookaholic—a Facebook page dedicated to celebrating female authors. I just couldn’t love her more! Such an inspiration, so sweet and a champion for authors — even debut ones like I am! Sort of like you, Susie 🙂 thanks for sharing! I love this and feel like I’ve learned even more about Jenny! I love Jenny and all she has done!! She was an awesome woman to feature on your Balance Project!! What a wonderful article! I truly admire Jenny for all the reasons you listed above and for her kindness! Jennifer doesn’t just share books, she shares her heart with authors and readers alike. She has carved her name on my heart in so many ways. So honored to know her. So glad she is my friend. She is truly a selfless giver of joy. Jennifer has been so good to all of the readers, even though she is a little hard on my bank account! She has introduced us to so many books even through her own trials. So yes she has carved her name on my heart! Great interview!